“The greatest challenge of the day is: how to bring about a revolution of the heart." —Dorothy Day, co-founder of the Catholic Worker movement. 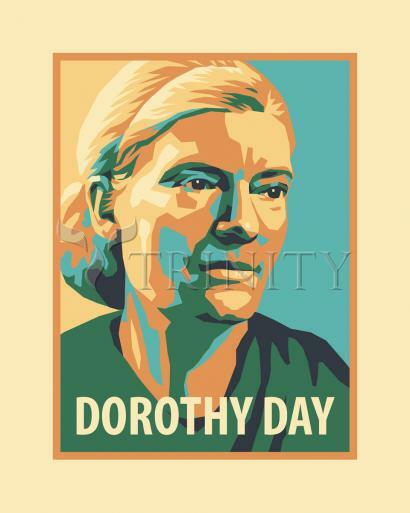 Dorothy Day, founder of the Catholic Worker movement, was born in Brooklyn, New York, November 8, 1897. After surviving the San Francisco earthquake in 1906, the Day family moved into a tenement flat in Chicago's South Side. It was a big step down in the world made necessary because John Day was out of work. Day's understanding of the shame people feel when they fail in their efforts dated from this time. It was in Chicago that Day began to form positive impressions of Catholicism. Later in life she would recall her discovery of a friend's mother, a devout Catholic, praying at the side of her bed. Without embarrassment, she looked up at Day, told her where to find her daughter, and returned to her prayers. "I felt a burst of love toward [her] that I have never forgotten," Day recalled. When John Day was appointed sports editor of a Chicago newspaper, the Day family moved into a comfortable house on the North Side. Here Dorothy began to read books that stirred her conscience. Upton Sinclair's novel, The Jungle, inspired Day to take long walks in poor neighborhoods in Chicago's South Side. It was the start of a life-long attraction to areas many people avoid. Day had a gift for finding beauty in the midst of urban desolation. Drab streets were transformed by pungent odors: geranium and tomato plants, garlic, olive oil, roasting coffee, bread and rolls in bakery ovens. "Here," she said, "was enough beauty to satisfy me." Day won a scholarship that brought her to the University of Illinois campus at Urbana in the fall of 1914. But she was a reluctant scholar. Her reading was chiefly in a radical social direction. She avoided campus social life and insisted on supporting herself rather than live on money from her father. Dropping out of college two years later, she moved to New York where she found a job as a reporter for The Call, the city's only socialist daily. She covered rallies and demonstrations and interviewed people ranging from butlers and butlers to labor organizers and revolutionaries. She next worked for The Masses, a magazine that opposed American involvement in the European war. In September, the Post Office rescinded the magazine's mailing permit. Federal officers seized back issues, manuscripts, subscriber lists and correspondence. Five editors were charged with sedition. In November 1917 Day went to prison for being one of forty women in front of the White House protesting women's exclusion from the electorate. Arriving at a rural workhouse, the women were roughly handled. The women responded with a hunger strike. Finally they were freed by presidential order. Returning to New York, Day felt that journalism was a meager response to a world at war. In the spring of 1918, she signed up for a nurse's training program in Brooklyn. Her conviction that the social order was unjust changed in no substantial way from her adolescence until her death, though she never identified herself with any political party. Her religious development was a slower process. As a child she had attended services at an Episcopal Church. As a young journalist in New York, she would sometimes make late-at-night visits to St. Joseph's Catholic Church on Sixth Avenue. The Catholic climate of worship appealed to her. While she knew little about Catholic belief, Catholic spiritual discipline fascinated her. She saw the Catholic Church as "the church of the immigrants, the church of the poor." In 1922, in Chicago working as a reporter, she roomed with three young women who went to Mass every Sunday and holy day and set aside time each day for prayer. It was clear to her that "worship, adoration, thanksgiving, supplication ... were the noblest acts of which we are capable in this life." Her next job was with a newspaper in New Orleans. Living near St. Louis Cathedral, Day often attended evening Benediction services. Back in New York in 1924, Day bought a beach cottage on Staten Island using money from the sale of movie rights for a novel. She also began a four-year common-law marriage with Forster Batterham, an English botanist she had met through friends in Manhattan. Batterham was an anarchist opposed to marriage and religion. In a world of such cruelty, he found it impossible to believe in a God. By this time Day's belief in God was unshakable. It grieved her that Batterham didn't sense God's presence within the natural world. "How can there be no God," she asked, "when there are all these beautiful things?" His irritation with her "absorption in the supernatural" would lead them to quarrel. What moved everything to a different plane for her was pregnancy. She had been pregnant once before, years earlier, as the result of a love affair with a journalist. This resulted in the great tragedy of her life, an abortion. The affair and its awful aftermath had been the subject of her novel, The Eleventh Virgin. The abortion, Day concluded in the years following, had left her barren. "For a long time I had thought I could not bear a child, and the longing in my heart for a baby had been growing,"she confided in her autobiography, The Long Loneliness. "My home, I felt, was not a home without one." Her pregnancy with Batterham seemed to Day nothing less than a miracle. But Batterham didn't believe in bringing children into such a violent world. On March 3, 1927, Tamar Theresa Day was born. Day could think of nothing better to do with the gratitude that overwhelmed her than arrange Tamar's baptism in the Catholic Church. "I did not want my child to flounder as I had often floundered. I wanted to believe, and I wanted my child to believe, and if belonging to a Church would give her so inestimable a grace as faith in God, and the companionable love of the Saints, then the thing to do was to have her baptized a Catholic."